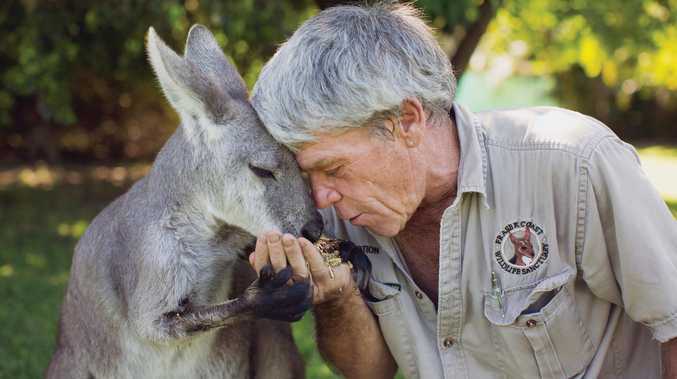 IN THE kitchen of the Fraser Coast Wildlife Sanctuary, Ray Revill can be seen attempting to bottle-feed a kangaroo joey in his care. Just moments later, he is captured on security footage picking the joey up and thrashing it on the ground before its tiny body goes limp. This sickening footage was released on Friday as the former sanctuary boss of 10 years pleaded guilty in Maryborough Magistrates Court to animal cruelty. Revill, 62, killed 11-month old kangaroo 'Rolly' by slamming it on tiles the morning of January 10 last year. Sanctuary volunteers attended the sentencing, tearing up and shaking their heads in disgust as the gruesome details were read out. Revill, who has relied on Centrelink since, was removed from his top role at the sanctuary immediately after the explosive allegations arose last year. The court heard attacking the joey was a "spur of the moment" decision fuelled by Revill's anger and mental health issues. Revill believed Rolly was sick and threw him "out of frustration". Defence lawyer Natasha Schumacher said leading up to the incident, the joey had stopped eating and was having spasms leading Revill to believe it had caught a disease that had been affecting the sanctuary's resident kangaroos. She referenced the CCTV footage where Revill could be heard saying "not another one". "He became frustrated," Ms Schumacher said. "This is completely out of character for him." Revill was said to have given misleading statements to police when questioned, including claiming he had attempted to resuscitate the joey. Magistrate Terry Duroux rebuked Revill for betraying an animal he was supposed to provide care for, saying the "disturbing" crime was at the "serious end of animal cruelty". He ordered Revill serve 12 month's probation, perform 150 hours of community and pay court fees of about $1500. Revill cannot purchase or own an animal, aside from his dog, for 12 months. He must also seek help for his anger during the probation period. Outside court, despite having just been sentenced on a guilty plea, Revill maintained his innocence, telling reporters the kangaroo was dead before he threw it.